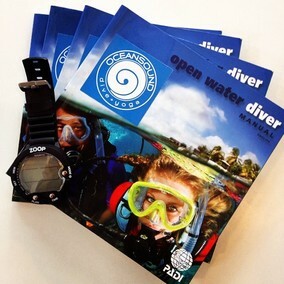 The PADI Open Water course is the world's most popular and most recognized dive certification course. Koh Tao is the perfect place to learn to dive, with plenty of calm, clear coral reefs teeming with aquatic life. Ocean Sound Dive & Yoga is ranked #1 in Koh Tao diving schools on Tripadvisor. We teach small group sizes of a maximum 4 students per instructor, to ensure plenty of personal attention from our excellent team of professional instructors. Our course schedule is streamlined to make the most of your time on Koh Tao. The course takes only 3 days to complete, after which you will be certified to dive to a depth of 18m, for the rest of your life! No diving experience is required for the PADI Open Water Course. The course includes an orientation, a pool session where you practice essential skills and become familiar with the dive gear, two academic sessions to cover the practical theory of diving, and four beautiful open water dives at a variety of Koh Tao's famous dive sites. ​Wondering what you will see during your dives? Watch this 60 second video. You will be able to see stingrays, barracudas, giant groupers, eels, turtles, butterfly and angel fish, and possibly even the elusive and incredible whale shark: the biggest fish in the world! ​Have a look at our dive site schedule, or check out our spacious, comfortable dive boat! If you'd like to reserve your spot to dive with us, please book online or send us an email (info@oceansoundkohtao.com) with your requested course(s) and dates. If you prefer to chat in person, email us with your ferry arrival information and we will arrange a free taxi pick up to bring you from the pier to our dive school to discuss the course and show you around. No commitment or deposit necessary! *Pickups are available from 8:45am-4pm, and must be arranged at least 1 day in advance, prior to 5pm, please! PADI course, and we teach you how to use a state-of-the-art dive computer. GoPro rental is available for 500B. Ability to swim 200m continuously (any technique/no time limit) AND stay afloat / tread water for 10 minutes. The swim test is conducted in the swimming pool. You will be required to fill out a PADI medical form before starting your course. Those with major medical conditions (asthma, diabetes, epilepsy, heart etc.) require prior written approval from a physician. This can be done on Koh Tao if needed, but please inform us ahead of time if there are any potential issues.